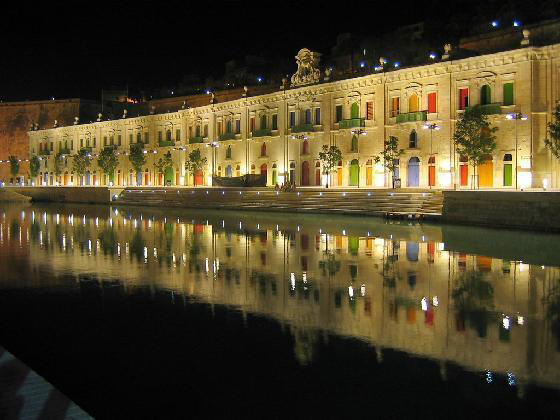 The popular Valletta Waterfront must rank as one of the best regeneration projects undertaken in Malta in recent years. 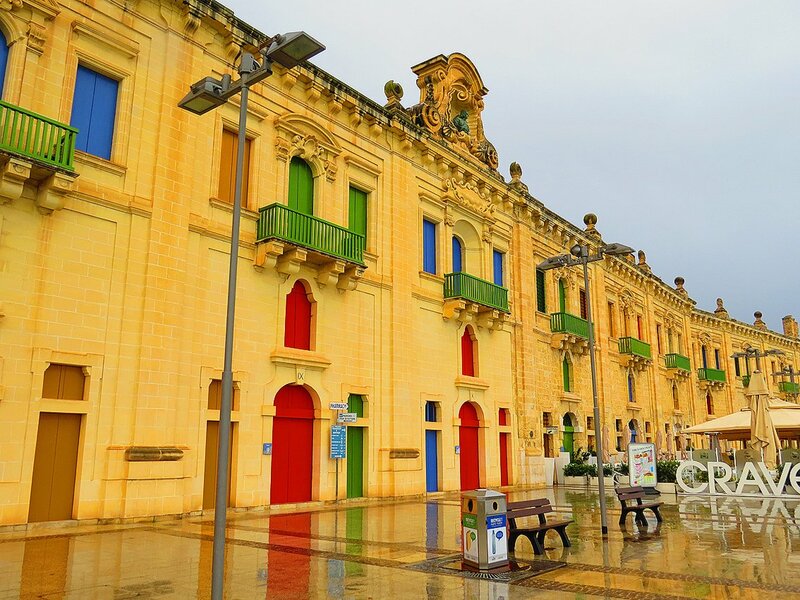 The project started in 2002 and was completed by 2007, transforming the abandoned baroque wharf in a highly imaginative way to become one of Europe’s most attractive cruise liner terminals, going on to win a European Union Prize for Cultural Heritage. The waterfront was originally the Pinto Wharf, constructed in 1752 by Grandmaster Manuel Pinto de Fonseca. It consisted of nineteen stores and a small church. The complex suffered great damage during the Second World War since the Grand Harbour area was bombed relentlessly by the Axis powers. The project saw the renovation of the complex and the displacement of the road, which previously passed in front of the buildings, now relocated at the back of the complex. Where stores had been completely destroyed only the façade was rebuilt – others which had suffered less damage were restored in their entirety. The freed up space at the front became one of the most attractive outdoor locations in the city, a large open piazza featuring a number of shops, cafes and restaurants housed in the original store buildings. Sleek cruise liners, the modern but attractive maritime holiday behemoths, have replaced the goods-carrying vessels of Pinto’s days – adding yet more colour and vim to the place. A curiosity of the complex is the multi-coloured doors and windows of the wharf buildings. What might at first glance be seen as a whimsical addition by the project’s planners is in fact a throwback to a historical accuracy. In the time of the Knights the buildings’ apertures were painted with colours signifying the different types of goods that were once stored in them. Blue signified storage of fish, green for produce, yellow for wheat and red for wine. The waterfront also contains the small church dedicated to the Holy Family’s Flight into Egypt. Like the rest of the complex it dates to 1752 and was also bombed in World War II, but has since been meticulously restored. Mass is celebrated here every Saturday evening. The waterfront is at its most lively when one or more cruise liners are in town and there’s a visible flurry of activity, making it a perfect people watching place. Summer evenings on the other hand is the time to be seen there, with diners making for the best outdoor tables offered by the varied eating places. 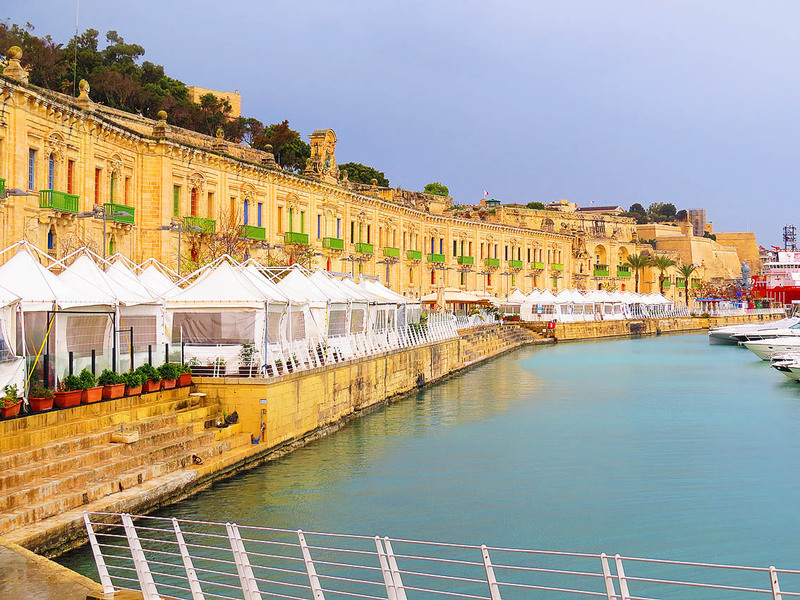 Valletta Waterfront is a fifteen minute walk from the city’s entrance. The half hourly Valletta circular bus (No. 130) from Castille Place serves the venue. The Barracca Gardens elevator is also a convenient means of getting there.